Those of you that have had the misfortune to read any of my previous meandering missives will be aware that I have harped on in the past about club runs staying together and everyone looking after each other. So it is that I apologise unreservedly to the poor soul that we dropped on Norley Hill. I honestly had no idea. 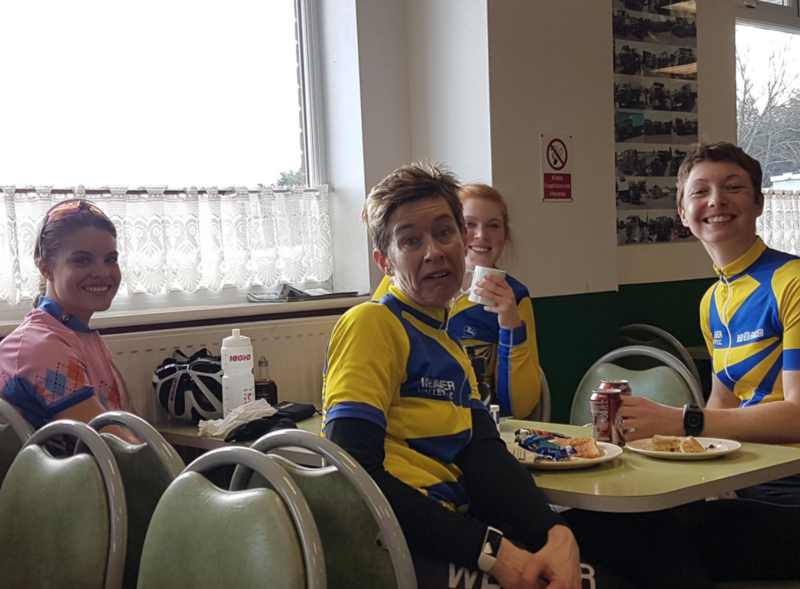 I was at the front leading the group and as I am exceedingly unfit, I thought that by riding at my pace everyone would be OK. We re-grouped at the top of Norley Hill and again at Hatchmere so thought we were all together. I am sorry my pace judgement was wrong. I hope we see you out again soon. Yesterday really was one of those days. I’d volunteered to lead the run to Prees and thought I’d make things a little interesting by going a different route to normal. I have pretty good knowledge of many Cheshire lanes as well as the Peak District and many parts of North Wales and so usually I know the route I want to take even if it is a bit weird. The roads to Prees are different, not a usual stomping ground and so I resorted to planning a route and uploading it to my Garmin. Big mistake as this is not something I usually do. A large group set off from the club approximately consisting of, Brummie Ron (that’s probably wrong), Matt’s Dad, Paul S, Louise, Anthony T (I’m doing no training at all, just commuting 200 miles a week), Emily (recently escaped from a Peak District loo), Carol (‘really I do nothing, no exercise at all’, ‘what do you do for a job Carol?’, ‘Oh, I’m a professional fitness instructor’), Steve M, Laura (in need of some shades), Paddy (strong like bull), BFG Ken, future World Tour star Matt, Steve Lucas, Tony B, Craig, Paul G, 1 mislaid rider and Me. There was no sign of Woody. Things didn’t start well, 5 minutes in to the ride I realised we were not actually on the correct road already, no idea how that happened! I mentioned it to Paul G but we decided to keep it quiet, we’ll get on the right road eventually. I zoomed the Garmin display out and saw where we should be heading so trusted we would meet up eventually with the correct route. At the top of Norley hill we did. Through the forest the chatter from the group stops simply because everyone is too busy saying, ‘below’ and ‘hole’, in order to converse. So many of Cheshire’s roads are truly shocking and dangerous, it’s ridiculous. Anyway, at Ashton Hayes we turned right and Steve Lucas became the next unfortunate victim of my relying on technology and not nous. We went through Mouldsworth and towards Manley, Steve and I having a great old chat, I looked down at the screen too late, shouted, ‘left’, but it should have been a different left. Steve and I nearly fell off, no idea what happened behind but I could already feel dark mutterings behind me. Steve turned off soon after this, no longer able to take the fear of falling or any more wrong turns. Luckily my hare-brained plan was designed around having a tail-wind on the way out and in this part at least I succeeded as far as was possible and so our merry band rode with said wind and the sun on their faces through a couple of Traffords; Bridge and Mickle. A quick right and left at the main Chester road and we were back on the quieter lanes. Matt came along side, ‘are we turning off anywhere as I need to visit the little boys room?’ The truth was I had no idea as i’d zoomed the Garmin out some time ago but I bluffed it anyway, ‘nah, you’ll be alright’. Luckily Matt is plenty fast enough and so he caught up in no time at all. When Anthony asked the same question a short while later I was, although still clueless as to the detail of the route, prepared with an answer, ‘we’ll stop and wait if we get to a junction’, I said. Sorted. As is his wont, Craig detached from the back of the group at some point, probably to get on a road he recognised and felt safe on. Somewhere shortly before the fairly cute village of Hanmer it was Carol’s turn to climb over the hedge. What happened next was not entirely my fault. Just before Carol made her announcement I could see we needed to turn right soon. Unfortunately Carol climbed the hedge opposite said right turn and part of the group carried on, part of the group stopped up the road a bit and I just plain forgot about the directions. 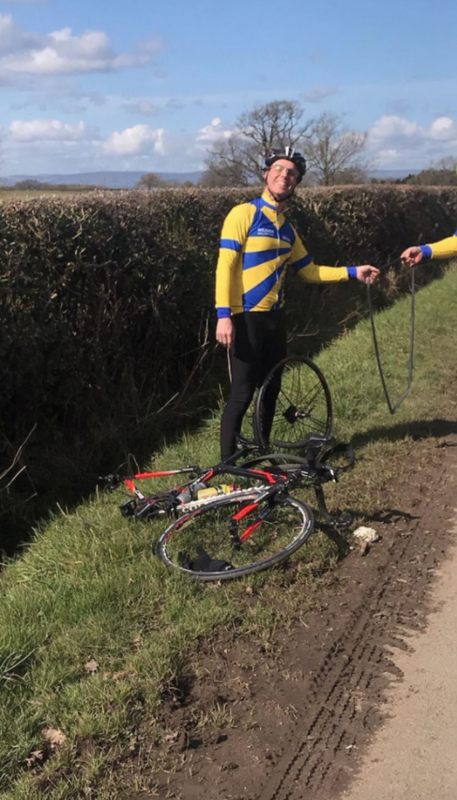 By the time we got going again I noticed the latest mishap and mentioned it to Matt, he took the pragmatic view of, ‘it’s a nice day and we will get there in the end’. I looked at the Garmin and it did indeed look like our road and the correct route would eventually collide. Several miles later it became obvious that this was not going to happen and so I called a halt and spent an age fiddling with the infernal Garmin before getting a route that was about 7 miles to Prees (and then another few to Prees Heath, our cafe stop). We set off. Bang! My rear tyre blew. ‘John!!! !”, several people cried. I could understand the frustration but at least it was sunny and warm and, as I mentioned earlier, the wind was on our backs. A strange puncture, no thorn or glass and a really neat hole in the tube. Peculiar. Laura took a couple of excellent pictures. Puncture fixed, we got going again, Matt and me on the front, talking variously about my past failures and his future successes. I was engrossed in the conversation as a left turn came and went too quickly. ‘Stop! Left, left, left!’, I shouted. More unrest, more turning around in the road. Prees arrived, Matt and I still on the front in to the surprisingly solid headwind for the 3 miles or so to the cafe. There were cheers from several members of the group as we turned in to the cafe car park. I was a bit like Shackleton leading our resolute band to the safety of Elephant Island. For beans on toast. During lunch (the girls on their own table, taking drugs, comparing hairstyles and discussing the help pages in Cosmo), I was asked about the route home. It was at this point that Steve stepped up, ‘I’ll lead’, he said, something like Superman would. Nice. Hands washed of the poison chalice. Outside of the cafe a very pretty picture was taken by me of our motley crew before we set off again. A more handsome bunch you couldn’t find. Well it was the best I could do outside the cafe at that moment. Tony told me he would be going home at his own pace and so it was that after several miles he slid off the back in order to do just that. Shortly after this we got to a junction and Steve wasn’t sure of the way, ‘Yes!’, I thought, it’s not just me. Matt’s dad stepped in to the breach and got us heading (almost seamlessly) towards Nantwich and down lots of lanes to Winsford. Whitegate arrived and down Cinder Hill Emily attacked, I followed and shortly afterwards Steve joined me. ‘Shall we catch her?’ he said. ‘No’, I replied, ‘let her sit there and suffer’. I’m nothing but caring. So along the road from Whitegate to Hartford Emily was very slowly reeled in before being jumped, Steve taking the victor’s spoils at the top of the hill. We all regrouped and rode down in to Hartford and through Northwich with everyone peeling off to go home at various points. Matt, just about warmed up by this point, came with me, heading to Pickmere and beyond to get some speed work done. Paul S came along also in order to get the century in. I returned home with about 103 miles and 3,000 feet of climbing covered, tired but content in spite of the day’s travails. 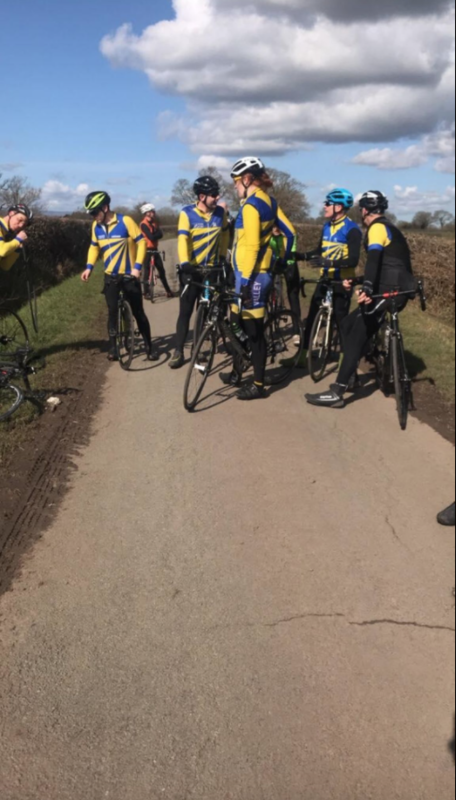 We had been a chatty, good humoured and well behaved group, many of us on our summer bikes for the first time in months and feeling frisky like spring lambs. As a post-script, when I got home I found out what the puncture problem was; a small gash in the tyre side wall, the replacement tube pocking through, waiting to pop at any moment. Was it the case that someone tried to knobble me in order to get to the cafe more quickly? We may never know…. Llanberis 2018. A game of two halves.